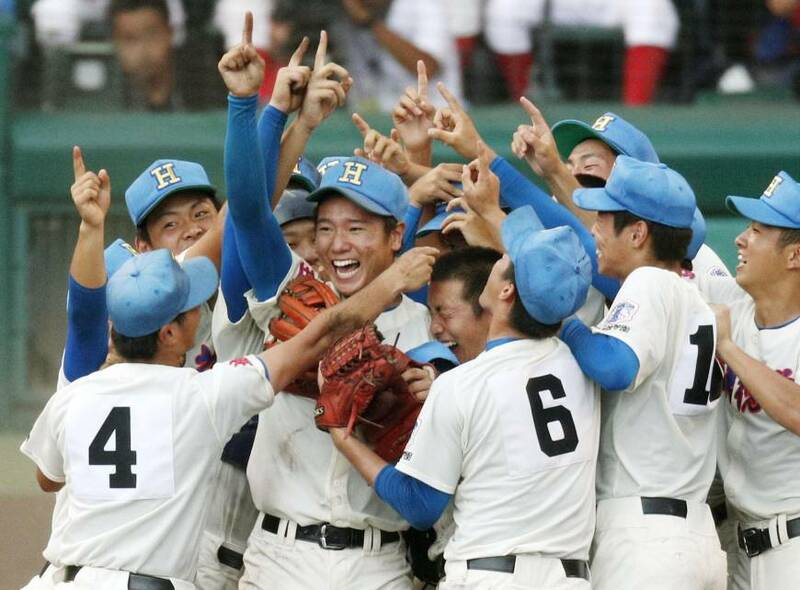 Hanasaki Tokuharu celebrates after winning the National High School Baseball Championship title on Wednesday at Koshien Stadium in Nishinomiya, Hyogo Prefecture. NISHINOMIYA, HYOGO PREFECTURE （Aug 23, 2017　The Japan Times- Kyodo）– Manaya Nishikawa went 3-for-6 with four RBIs to lead a 16-hit attack as Hanasaki Tokuharu beat Hiroshima’s Koryo 14-4 at the National High School Baseball Championship final on Wednesday. Hanasaki Tokuharu, managed by Takashi Iwai, became the first school from Saitama Prefecture to win the summer classic, which was first played in 1915. Hanasaki Tokuharu scored 10-plus runs in all six of its games. A total of 3,839 schools took part in regional qualifiers for the finals that started on Aug. 8 — a day later than scheduled due to a typhoon — and featured a record 68 homers. In the 29-hit slugfest in front of 43,000 at Koshien Stadium — which was built to house the event — Yuki Nomura, Hikaru Sunaga and Tomoharu Iwase drove in two runs for Hanasaki Tokuharu. Hanasaki Tokuharu starter Sui Tsunawaki gave up three runs and seven hits in four-plus innings of work, and Tatsuya Shimizu worked the next five innings, limiting the damage to a run. For Koryo, who advanced to the final for the first time in 10 years, Shosei Nakamura went 3-for-5 with a pair of doubles and a single to equal a single-tournament hits record with 19. On Tuesday, he hit his sixth home run, which broke the tournament record — set in 1985 by Kazuhiro Kiyohara. Hanasaki Tokuharu catcher Sunaga said the idea had been to bust Nakamura inside with hard stuff. Koryo lefty Ginjiro Hiramoto allowed eight runs in four-plus innings.